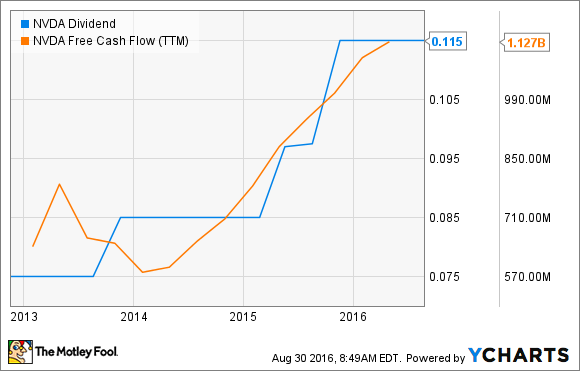 Will NVIDIA Corporation Raise Its Dividend in 2017? The chip company's quarterly payout is indeed a strong candidate for a raise next year -- or even earlier. Those dividend pennies sure stack up over time. Image source: Getty Images. NVIDIA (NASDAQ:NVDA) has been paying a quarterly dividend since November, 2012. In less than 4 years, the computer chip designer has increased its payouts three times. Will NVIDIA boost its dividend payments again in 2017 -- or maybe even earlier than that? NVIDIA's first dividend checks were written out at $0.075 per share. The payout rose to $0.085 per share a year later, then stayed at that level for six quarterly payments in a row. In 2015, the dividend boots were back with a vengeance. NVIDIA increased its dividend payout to $0.0975 per share in May, and took another jump to $0.115 per share in November. That's where we stand today. NVIDIA's dividend history is short and unpredictable, making it difficult to build any serious forecasts from this information alone. My job gets much easier if we bring another metric to the party. NVIDIA's free cash flows were suffering in 2013 and early 2014. The Tegra line of mobile processors was spinning its wheels and draining the bottom line, and trailing free cash flows took a 25% haircut during this period. Tapping the brakes on dividend growth made perfect sense at the time. NVDA Dividend data by YCharts. Free cash flows nearly doubled over the next two years, and dividend payouts increased by 35%. The last dividend increase fell in November of last year. The steady level includes a September payout, announced just a couple of weeks ago. NVIDIA's cash flows are still growing fast, and should continue to do so as the recently released Pascal chip platform works its way through the season for holiday-gadgets production boosts. Polaris has been greeted with strong reviews and equally impressive early sales. If NVIDIA's cash flows continue to rise skyward, it seems obvious that a dividend increase will follow in November. It's still too early to say whether the Polaris momentum will carry all the way through another dividend boost in 2017, but management may want to get into a predictable cadence just to keep its shareholders happy. As a side effect of NVIDIA's skyrocketing share prices, the dividend yield is plunging. 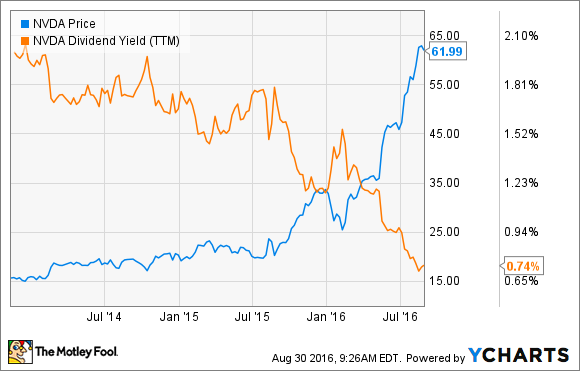 The trailing yield reached above 2% in 2014, but has dipped all the way down to 0.7% today. A rapidly rising share price is certainly a nice problem to have, but NVIDIA sure doesn't look like a fantastic dividend stock at these yield levels. A couple of generous payout increases should relieve that issue. Strong cash flows make that strategy easily affordable, and NVIDIA has been willing to play that card before. In other words, I expect a significant dividend boost from NVIDIA in November, 2016. As long as the wheels don't fall off the Pascal train, another increase should follow in 2017.